Last week it was cinnamon waffles and now I’m posting about cinnamon dutch babies. I’m breakfast-crazy or at least cinnamon-crazy. Either way, I’m not complaining. This is a simple but impressive breakfast and it takes the not-so-humble dutch baby and makes it, dare I say, even a bit better. It’s a sweet and cozy way to spend a Saturday morning with a pot of hot coffee and the crosswords. It’s been a pretty crazy couple of weeks. We’ve been tying up loose ends, wrapping up projects and beating deadlines so we could make some time for a visit with family. Tomorrow we’re flying to Ontario to visit my mom in the hospital, so it will be pretty quiet here until next week or so. I’ve got a stack of books, some homemade fig newtons (my parent’s favorite) and a few Ritter Sport bars to help keep my mom in good spirits. Preheat oven to 400. In a large cast iron pan, heat butter and add in sliced apples, cinnamon and sugar. Saute until the apples are golden brown and the sugar has melted into a delicious caramel sauce. In a large bowl, whisk the eggs together and add in flour and milk. Whisk until combined and pour over the apple mixture. Place skillet in oven and bake for 20 minutes or so, until the pancake is fluffy and golden brown. Remove from oven and squeeze lemon juice over top and sprinkle generously with powdered sugar. Serve immediately. I’ve never tried one of these before. I MUST make this soon! I hope your mum will be ok…have a safe trip…sounds like you are prepared! The dutch baby ( love the name!) looks great! I am going to try it this weekend! Wow! I may have to make this for breakfast in the morning. Sounds like a perfect weekend breakfast… Safe travels and hope your mom is ok.
Yummy Yummy!!! Safe travels and best wishes for your mom and whole family. This sounds wonderful. All the best wishes for your mom. I hope your mom is ok! Is there any way I can adapt that cinnamon waffles recipe for pancakes instead? I am sadly without a waffle maker, but they sound so good…especially with the addition of oatmeal. Just a note–I’m so happy to have discovered your foolproof recipe for beer bread! The recipe I was using before never made the bread rise enough, but this one works out perfectly. I must have made at least 4 loaves in the last couple months because I’m getting constant requests for more. 🙂 I’ve been playing around with the cheese and herbs that I add every time. I threw in some spiced havarti and lots of fresh dill for a loaf that accompanied some homemade clam chowder, and another loaf became rosemary beer bread for apple-cheddar fondue dipping. Oh yum. This was a staple at my house on Sundays as a kid – w/o cinnamon and apples tho. YUM! Am going to give it a renaissance at my place. Hope everything’s going to be ok. The first time I had one of these was at Minnie’s in Seattle, and I’ve been in love ever since. mmmmmmmmmm. RIP Minnie’s…but LONG LIVE the dutch baby! I love these things! This is one of my favourite breakfast things. I have a similar recipe from an old Danish cookbook that I picked up in a used bookshop in Sidney, BC. I recommend some nice, thick-sliced bacon as a side. Yummers. Have a safe trip. Home-made fig newtons, mmmmmm. I bet this tasted amazing in a cast iron; helping keep all the apple juices inside stewing away. One of my all-time favorite breakfasts — and your looks so perfect! This looks so great! Perfect for the Saturday morning you described. Great picture! I love how old and awesome your pan is! I’m sending happy and healthy thoughts to your Mom! I used to make these in small 6" cast iron pans for individual servings back in my B&B; days…always well received. Safe journey and healing wishes to your mom! All the best to you mom! 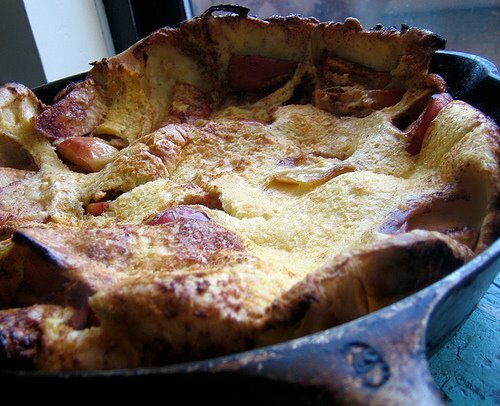 I feel bad about asking such a stupid question when you’re so busy…but if I’m not an apple/cinnamon fan, will this recipe result in a “regular” dutch baby if I just omit the apples and the cinnamon? Or do I need to compensate for the loss of those ingredients somehow (sugar? something else?)? Thanks! I made this for dinner tonight, and it was amazing! I was a little proud of myself when it came out of the oven looking so perfect, and had a really hard time not eating the whole thing. That sounds delicious! I am going to try that out for breakfast tomorrow- I have some apples to use up. YUM! I sure could cozy up to that! I roughly figured the calories of the whole thing to be 880. 440 for a plurge breakfast is not too shabby. Looks so good! wow, this looks like an apple Yorkshire pudding! that dutch baby looks awesome, but I was more excited about the fact that you said you made homemade fig newtons! I want to try that….is there a recipe in your archives…I am a new reader (sort of) , so maybe you have already posted a recipe and I look like an idiot asking! P.S. hope your mom is o.k. I have never had a dutch baby before. I will have to try this one out. I love apples and cinnamon, so how could I go wrong? I’ve never had a dutch baby before but have been intrigued by them for a while (that sounds weird). Anyway, this looks delicious! Hope your mom is okay. Since my husband hates cinnamon I think I have to make this and have it all to myself! thanks hag. give it a try & let me know how it goes. meg, it's definitely for cinnamon lovers! thanks for the well wishes. jennie, it sounds like you should resurrect this, for sure. hayley, it is wonderful. i wish i could eat it every week! miss kate, dutch babies are awesome! brie, bacon would be so good with this. i agree 100%! dawn, cast iron is so handy. i love my pan…and it's ages old (from my husband's granny). thanks cookie pie. thanks for the kind words. maris, it makes any saturday morning awesome. anon, i've made regular dutch babies in small pans too. works really well. violet, yes, you can just omit the cinnamon & apples and cook away as usual. it will definitely work out well. anon, glad you loved it! let me know how it goes, heather! ellen, that's kind of exactly what it is. eatme, you just have to try one and you'll be hooked. so good! mrs l, you can just omit the cinnamon. a pinch of nutmeg or cardamom would be nice instead! take a deep breath, i’ll eventually post it, but you can use the wednesday chef’s recipe as a reference! it’s a good one.